This project started as a whisper of an idea influenced by my living and working in downtown OKC for over 5 years. During that time, I grew very close to the diversity of the population. I located there just after the 2008 economic crash and was witness to the opposite ends of the financial spectrum, Occupy Wallstreet movement in OKC, as well as the welcoming of the Thunder Basketball team, and the resurgence of downtown and Midtown. After taking on the job as Chair of the Art Department at Oklahoma City University and getting married, I moved to Edmond, where my wife attained a position as AP Art Teacher at Edmond Memorial High School. During that time it became apparent that I had sorely missed the energy and diversity that downtown had to offer and wanted to return as an artist, educator and witness to the people who live, work and visit Oklahoma City by including them in my newest personal project. As an artist and Illustrator, I am a recorder and visual storyteller of the human experience. I am also an educator who has taught workshops around the United States and am currently teaching as Professor of Illustration at the prestigious Savannah College of Art and Design (SCAD) in Savannah, GA and just completed a one-year residency at the Skirvin Hilton Hotel in Oklahoma City while also serving as “Distinguished Visiting Artist and Gallery Director” at Oklahoma City University within the Petree College of Arts and Sciences’ School of Visual Arts for the last 6 years. I had recently stepped down from the responsibilities of “Chair” so that I would have more time to dedicate to the “Will work For” project; because. As a portrait artist, I am a natural observer of people and all of the differences that make us unique. It was this diversity that I wished to portray in my newest personal project. We have all observed the many people who feel that their only way to make ends meet is by standing on street corners while holding signs that state that they “Will work for Food”, etc. I was inspired to ask myself, and then later others, what they would work for. What inspires them as individuals to sacrifice their lives, their labor, and their love enough that they will work for it? Sometimes, it is their children, sometimes an idea and sometimes a dream. I wanted to use the public window, and the central location of the Skirvin Hotel as the base of operations for gathering my inspiration, my research and my audience from the populace around me, while also creating and displaying the work for that very same audience. It was and still is my desire to help bring a visual display of answers to questions that we are all asking, “What gives life purpose?”. I want to contribute as much prominence to each model and each voice as I do to the corporate captains of industry, politicians and noted celebrities whose portraits I am commissioned to paint around the U.S.
My process was to set up a place where I could have my models sit, be photographed and sketched while I documented, through Social Media, News and Media Outlets, my models “Reasons to Work”. I set up a studio within the hotel on the street level with my paints, pallets, canvases and easel so that people walking by could observe the creation process. And when I wasn’t there, to see the paintings and sketches displayed as they are finished, as well as some of the selected cardboard signs created as documentation during the process. My working methods are traditional, drawing in charcoal and other mediums as well as painting, mostly in oils. I wanted to display and capture a wide range of people from local celebrities to the average blue-collar laborer who calls Oklahoma City home, or who happens to be visiting Oklahoma City during this process. Since my move to Savannah, I have continued the project with the diverse population of Savannah. At the conclusion of this project I will display the work in a Gallery Setting as an Exhibition and plan to invite as many of the models that helped to make this project possible. I wanted a reason and a chance to bring all of these divergent voices, faces, points of view together into one place so that everyone present will see themselves and their voices as equal and as worthy as another’s. The greatest enjoyment of being an artist is the extreme inner joy of bringing an idea to life that just 5 minutes before did not exist. It’s almost a God-like feeling and responsibility to be able to share these ideas and opportunities with my audience. My passion for creating and sharing these hard-won abilities with my many students is such a rewarding reason for living and continuing. This project has become such a part of my life now and it is my hope to continue on a national scale. I am extremely grateful that this project is getting a greater chance to be seen and shared with your audience. I would love to be able to continue sharing the progress of this project and am always looking for more inspiration and opportunities. So please feel free to pass along stories of people who you think might be interested in being a part of my project. Dwayne Johnson, was a carpenter that worked with a crew helping with the remodeling of the home and studio I had recently purchased to facilitate my families move to Edmond, OK. I was taken with his friendliness, his work ethic and his look. We were talking one day during one of their breaks, when the conversation came up about all of the paintings in my home. I informed him that my wife and I were artists, and of our backgrounds, and her recent move to Oklahoma. That prompted him to share how he had made Oklahoma his home. He had been a former gang member in California and had been in a few life-threatening situations, and he had the scars to prove it. He thought it best to move to a safer environment, and moved to Oklahoma where he had family. He faired well in Oklahoma and has since raised his family and extended family where he has worked as a laborer and then acquired the skills of a carpenter. So when we talked of this project I was working on he showed and interest and I reciprocated my interest in capturing his manly good looks and his story in his sign. 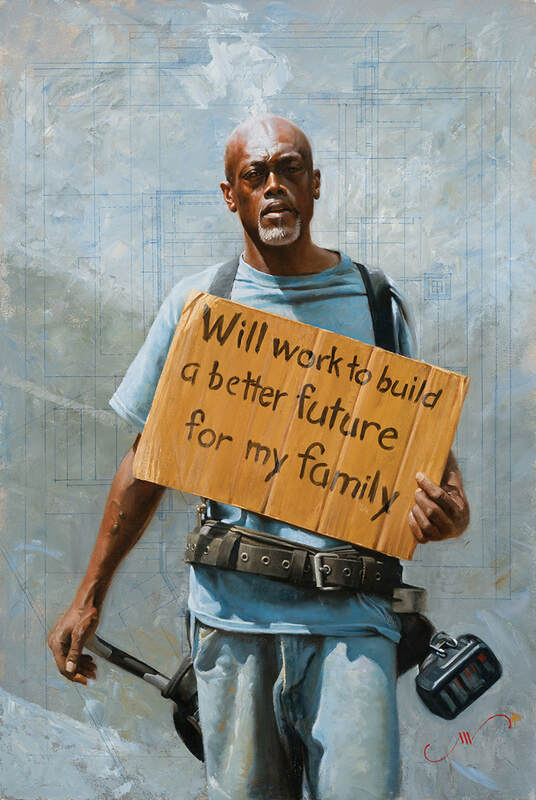 When asked what he would say, he knew immediately, "Will Work to Build a Better Future for My Family". I really enjoyed painting him with his tool belt, symbols of his trade, along with the blueprints, that served as symbols of the abstract idea and the requirements of making an idea come to life. Rick Sinnett. is a local artist in Oklahoma with a very colorful story and history. He has travelled the world and worked as an artist most of his adult life, as well as associating with some very famous artists as well. He has worked in many different mediums but made printmaking his primary medium, until he came up with the idea of creating a pictorial legacy for himself and the public at large. He wanted to paint murals. And paint he has certainly done. at the time of this painting, he was working on a short-term mural at the one of Oklahoma City's arts districts, "The Plaza District" where a new mural is created and displayed on a rotating basis to showcase new talent, seasons, and the artistic expression and resurgent growth of a once down-trodden neighborhood. Rick had already completed more than 100 murals by this time and he had been just recently voted Oklahoma's "Artist of the Year". His mission is simply stated, yet no so simps executed. A Couple of his murals have required the mountaineering skills to climb some 100 feet in the air every morning to paint murals on the sides of some very large grain silos, all the while carrying his materials, and lunch along with his courage, to get the job done. Mike Morgan, is a face that everyone in Oklahoma would recognize. He visits our home every evening as he delivers the weather forecast. Although most of time he reports on weather that can be described as mostly sunny, he is also there during those tumultuous times when Mother Nature demands our utmost attention. 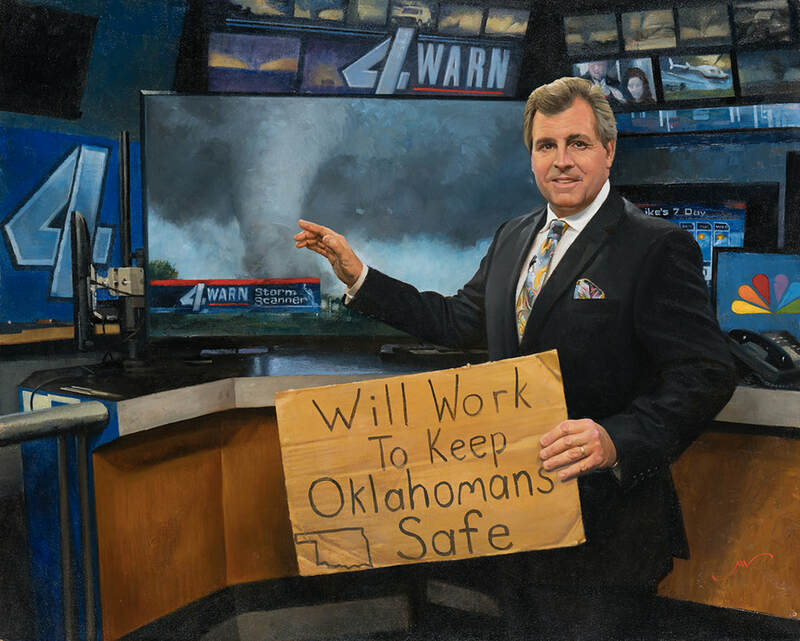 Oklahoma is known for its tornadoes and lucky for us, Mike Morgan is there to warn us. Mike has been associated with the National weather service since the age of 13 and his professionalism and passion have earned him many awards and worthy attention, just like the many colorful ties he wears on the air. I became acquainted with Mike through his daughter, who was a student of my wife Jime, while teaching High School Art at Edmond Memorial. I thought her perfect for a painting of a young cow girl that I wanted to paint. We met a number of times through art events at her High School. After garnering the courage to ask if Mike might be interested in being apart of my project his warmth and generosity were made apparent by his invitation to the KFOR studios in Oklahoma City to use his weather station as the background. Mike's dedication to keeping all of us safe was and is his motivating force and I, as an artist, and we as citizens, owe him a debt of gratitude for his passionate service. Joe Schmoe was one of those people I had the fortune to meet during my tenure as the Artist in Residence at The Skirvin Hilton Hotel in downtown Oklahoma City. I was visiting with another artist friend, Dean Wichita when two young people were passing by with their dog and saw my work through the big picture windows and knocked on the window and gave me the thumbs up. I waved the wayward travellers in and bought them some coffee and asked them about their travels. They had been hitchhiking and train hopping around the United States and looked like they could use some refreshments. Dean and I were enjoying their descriptions of life on the rail when I asked if they might be interested in being a part of my project. 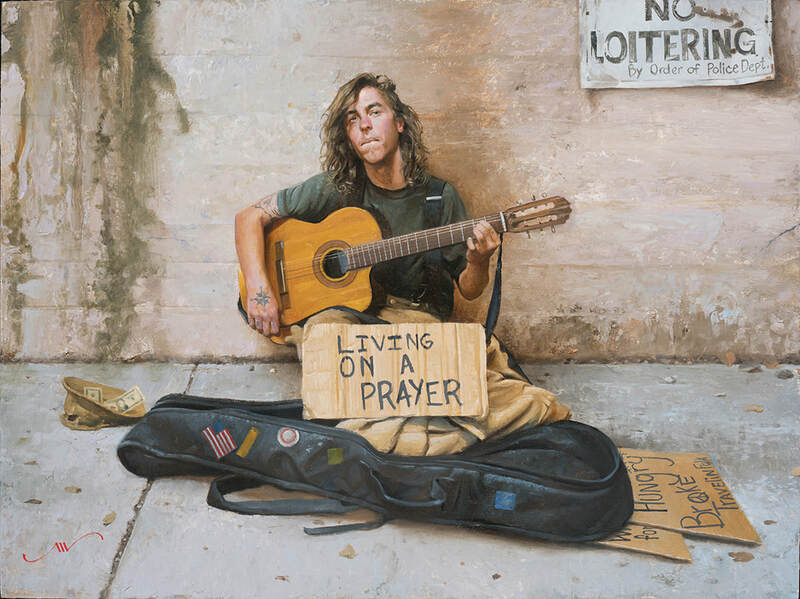 They were more than ready, because when I asked the young man, whom I only know by his nickname "Joe Schmoe" to make his sign on a piece of cardboard I had in my studio, he immediately reached inside his guitar bag and pulled out the sign you see represented in the painting. Being a father, I couldn't help but but be a little worried about the troubles that he and his young female friend might find on their travels. I wish them the best and hope that they find that destination that they are seeking. Mark and Carol Goodwin became subjects for my, “Will Work For“ series when Carol came into my studio asking if I might listen to her story. Her husband Mark, a long time accountant, had recently been diagnosed with Alzheimer’s. It’s effects ravaging his body and mind quickly. Mark with his bravery, and Carol and her loving support and kindness, wanted to use their story to bring attention to the millions who suffer from this dreadful disease. After seeing the love they had for each other, and the teasing smile in Mark’s eyes, I wanted them to be part of my series immediately. I was lucky enough to get to see Mark’s recognition of himself and the smile on his face when he viewed the finished painting, in time for their daughter’s wedding. There are people who come into your life that you will never forget, even in the face of a disease at robs us of our memories and her personality.￼ Please help bring greater attention to the needs to abolish this horrible disease and "END ALT". Dr. Bob Blackburn has been one of my greatest resources for the long term and grand representation of Oklahoma history through the more than 40 historical paintings and portraits that now adorn the Oklahoma State Capitol building, not to mention the many other private historical projects I have had the privilege of working on around the state. In that time he has also become a friend. Bob was one of the people I actually reached out to be a part of this project. His dedication to the state of Oklahoma and the accuracy of its history have made a huge impression on me and many others around the state. He is know as Mr. Oklahoma History and he has helped save and highlight that history so that it might not only be remembered but highlighted and celebrated. He now serves as executive director of the Oklahoma Historical Society a position that he has held since 1999, and which oversees all of Oklahomas museums. 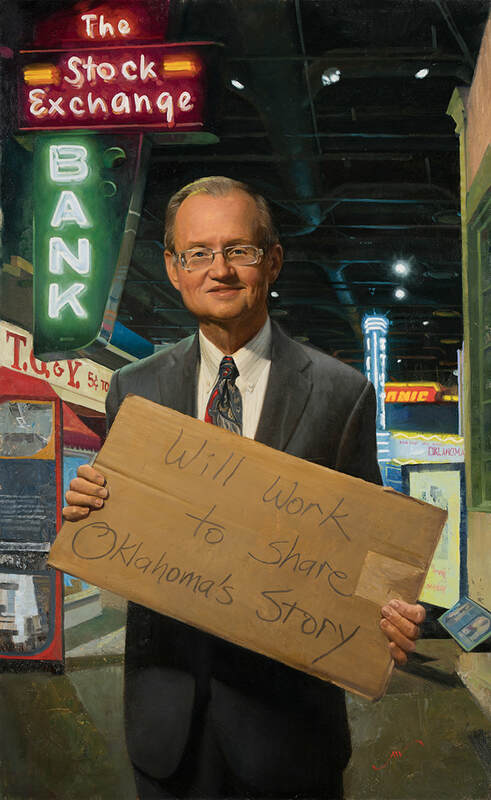 He was instrumental in planning and building the Oklahoma History Center, a 215,000 square foot museum and research center, which I thought to be the perfect background for his portrait. He had and continues to serve on numerous national and regional boards and committees. I am lucky to be able to call him friend and Oklahoma owes him a historic debt of gratitude for his passion to our shared history. Joe Washington, is in my estimate, one of the BIGGEST men that you will ever meet. And that is saying something when you stand next to him and are humbled in his presence by his soft spoken charm, gentle humility and are lucky enough to bask in the light of his smile. 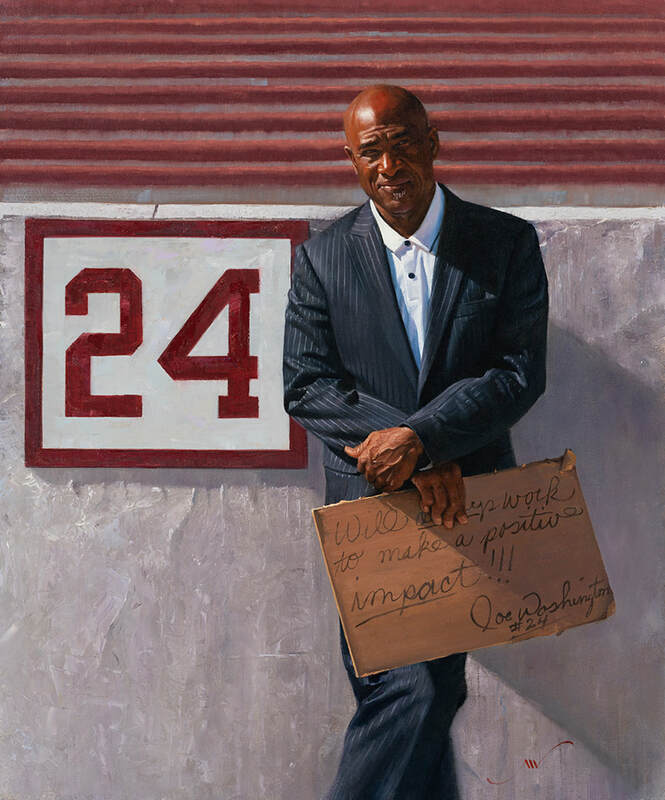 Joe doesn't stand more than 5'9" but his record as one of America's greatest college and NFL running backs stands taller than any billboard. If you are from Oklahoma, you probably know him as "Little Joe Washington" and the memory of him in his silver cleats flashing down the field or escaping the grasp of tacklers for one of his clench touchdowns, leaves all of his admirers with a little regret that as a two time First-team All American he finished third in the Heisman Trophy balloting in 1974 and fifth in 1975. Joe's successes are too numerous to record them all, but his record as the only NFL player to ever throw a touchdown, catch a touchdown and return a kickoff for a touchdown in a single game is a direct reflection of his motto "I will ALWAYS work to make a positive impact!!!" As he still does as successful business man and inspirational example to athletes and business leaders around the world. The day I got to meet with Joe about posing for me, I was nervous and giddy at being in such close proximity to someone that I still admire at my mature age. David Holt, is best described as a man that you can count on. His small town roots bely is first class mind and his genuine kindness and empathy for the common man he serves with uncommon character. His smile and lanky figure remind me of the former after and "everyman" Jimmy Stewart. I first had the honor and pleasure of meeting David when he was working with Governor Mary Fallin as a young aide. He credits his mother for as his inspiration for his public mindedness and even graduated from the same George Washington University. We were reunited after I had the honor of painting former Pro Tem Glen Coffee's portrait for the Oklahoma Senate and whose Senate seat he later filled as his districts representative. I was very excited to hear of his running for Oklahoma City's mayoral position and wanted to paint his portrait as he was on the campaign trail for the position. On the day he posed for me, he was operating in his most vaunted position, that of a father, with his daughter in tow for a day together at one of her school functions. David is truly a man of the people and a hero whose sign, "Will work for YOU" is a foundational reflection of his beliefs. 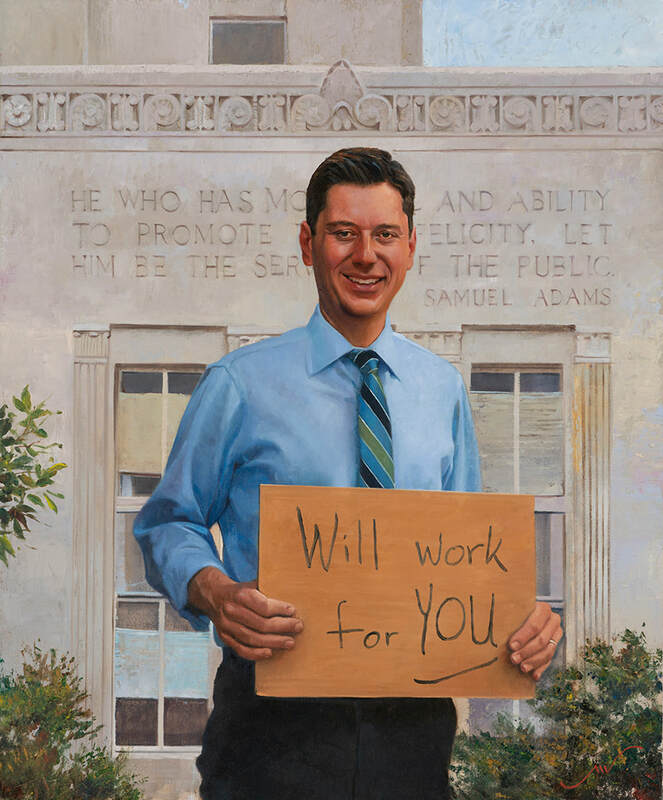 When asked what background David might want to be posed in front of, he imediately responded with the choice of Samuel Adams quote on the Oklahoma County Court House. Jane Jayroe Gamble, is the epitome of charm and grace, which is why she was probably chosen to represent the state of Oklahoma and later the United States as Miss America in 1966. I first met her like many of us when she came into our homes each night as she shared with us the news of our country and region. She is a spokesperson for many organizations and is on the board of many more but her focus has always been focused on service to others. 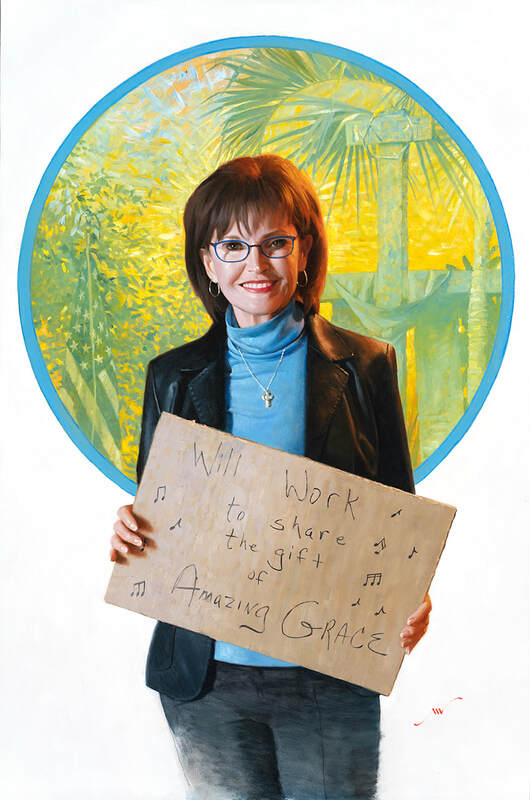 She uses her many talents, whether it be writing, speaking or leadership to help others but her focus has been on sharing the gift of "Amazing Grace". When you have the honor of meeting her, you will instantly recognize from whence comes her energy, her focus, and her smile. Mary Pointer, Senior Vice President of Republic Banking Oklahom City came into life literally when we were introduced by mutual friends an event at the Skirvin Hotel.. I was immediately taken with her captivating smile, and energy. She is a charmer of the first degree, but more impressive is her desire to serve. A true servant of goodness I was moved to ask her to pose for my project when her name kept coming up from many friends and accuantances who also sang her accolades and the graciousness of her heart. Mary says it better than anyone else could, "My goal is to serve the community both at work and with volunteer time. It is exciting to help people achieve their personal goals and the goals for their companies. By working together we create a better Oklahoma for generations to come In my volunteer time it is exciting to help provide a better quality of life". Mary is currently serving on more than two dozen local, state, national and international boards. What is even more remarkable is the fact that she is an active and willing participant for each of those committees. Pointer's involvement is authentic. She doesn’t do it because of name recognition; she does it because she truly cares. Known as a “network maven,” Pointer has forged relationships and used her connections to better her community. 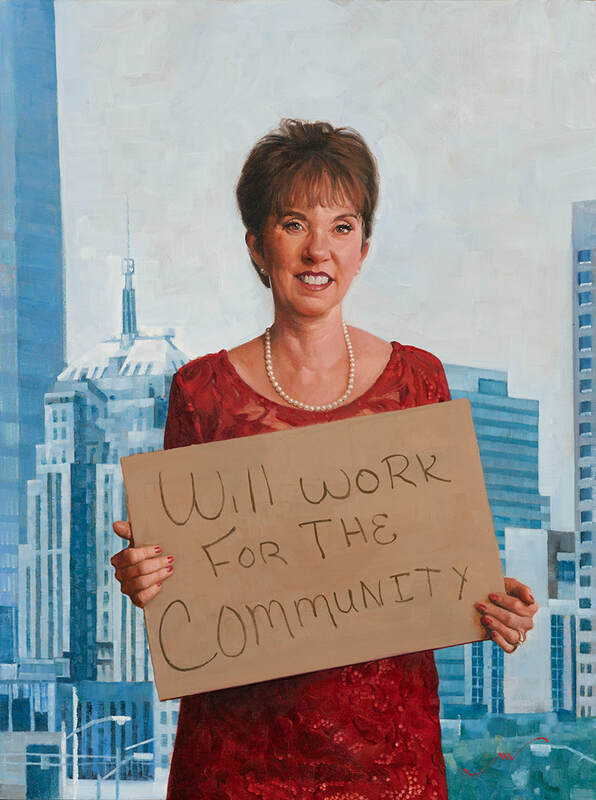 Whether it is her work with organizations such asPrevent Blindness and the Urban Library Council or her efforts to feed over 5,000 people and provide toys to children during the holidays, Pointer is always helping improve the quality of life for those in Oklahoma and beyond. To say that Renzi Stone is TALL is an understatement. That is obvious to anyone in the same room with him, but trying to describe him was best left to him. When I asked Renzi what he "worked for" and what were some of the words that he would use to describe himself, he took the question to heart and asked that I allow him to get back to me with some thoughts, Well once we continued our conversation at a later date he had a very introspective list put together for me. The list represented in his painting says many things about him but to say that he is driven leaves the description a bit like trying to minimize his presence in an elevator. Renzi made his initial splash into the limelight by being an incredible athlete at the University of Oklahoma. He has taken that same drive and applied it to everything in his life. He is the founder and CEO Saxum, a Marketing and communications agency, and is a sought-after speaker and serves on the boards of many local and regional boards. He is a man of influence, and he utilizes that influence to help others see and understand. He is a husband and father, who recently set off on a world tour to dedicate time with his family and to feed the curiosity of man who is always striving to better himself, for the benefit of those around him and for those he serves. Leona Mitchell and I are both Oklahoma Creativity Ambassadors but she is on a much greater level than I will ever achieve. Her voice raises her to the heights of Heaven, while my abilities keep me well grounded on the earth. 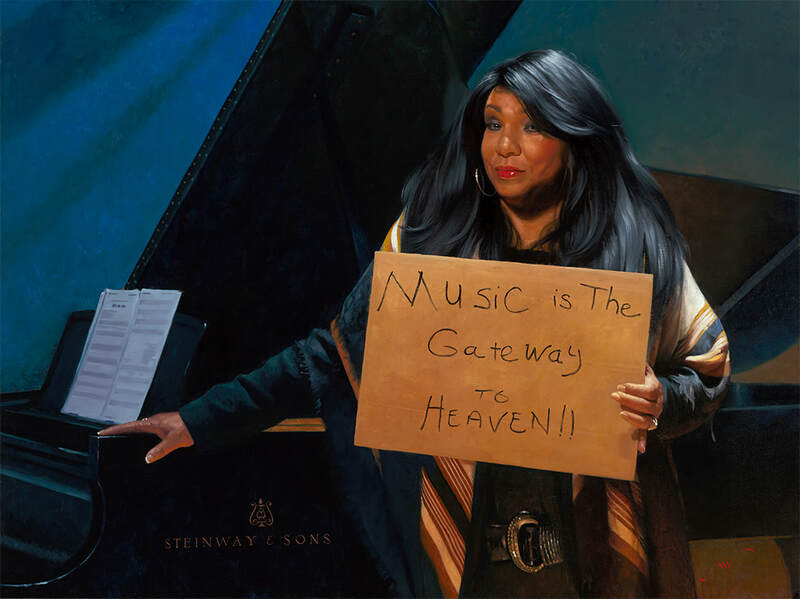 I had become a groupie when I heard her recording of Porgy and Bess' "Summertime" while I was working on my own visual rendition of the classic opera by Gerswin for a children's book, of the same name, published by Simon and Schuster. We have since become good friends often sharing laughs and the great hospitality of our mutual friend Judge Robert Henry. I had wanted to ask Leona to be a part of my project for some time but her travel schedule and the untimely death of her longtime admirer and husband Elmer Bush. I was not ready to give up on the hopes that Leona might still pose for me so I remained patient and waited until she was able to pose for me. We were finally able to meet at a place that held special meaning to both of us, Oklahoma City University, where she received her BA in Music and where I had served as the Chair and Artist in Residence at School of Visual Arts. Leona is still as beautiful as ever in life and spirit and I will always cherish our time together. A true blessing.